As indicated above, we were fortunate enough to see a number of smaller brands being shown in South Africa for a first time through the “independent “distributors. 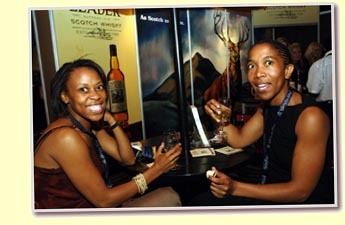 Of particular note was Compass Box (distributed by De Toren) which attracted a large number of visitors to their stand. Their Oak Cross, Peat Monster and now discontinued Spice Tree (which I really enjoyed) was available for tasting. It was a great pleasure to see Glenfarclas was on show from Forbes distributors and I was fortunate enough to taste their 25yo (which is definitely on the must have list). Forbes is also the distributor of Arran, Achentoshan, Bowmore, Connemara, Glen Garioch, Old Malt Cask range and Yamazaki. Naturally I, and a multitude of others spent quite a bit of time on their stand sampling their wares. The other major independent distributor, The Really Great Brand Company, had several stands, each showcasing their particular ranges, which include some of the world’s greats; Ardberg, Glenmorangie, Highland Park (disappointing though, no 18yo available to taste), Macallan and their number one product, Famous Grouse. The Famous Grouse Malt range has done a tremendous amount to highlight malt whisky of late. Moving on to the bigger players – Brandhouse, who also distribute Bell’s, J&B as well as Johnnie Walker , were showing their extended range of single malts that they represent in South Africa. These included Caol Ila, Clynelish, Cragganmore, Dalwhinnie, Glen Elgin, Glenkinchie, Lagavulin, Oban and Talisker. Being the size they are, they pretty much dominated the floor space with all their brands, and yes they did have their entire blended portfolio on show as well. Other notables were Pernod Ricard, with Aberlour, Benriach, Glen Keith, the Glenlivet, Longmorn and Strathisla were present albeit in a more subdued fashion.